Last night I attended our monthly quilt guild meeting. We meet 10 months a year on the 3rd Monday of the month. We skip July and December. July is too hot and lots of people are vacationing or up here in Maine waiting for the vacationers to arrive or depart from visiting . We don’t meet in December because of Christmas – we are all too busy trying to complete that last gift or waiting for the festivities to begin. 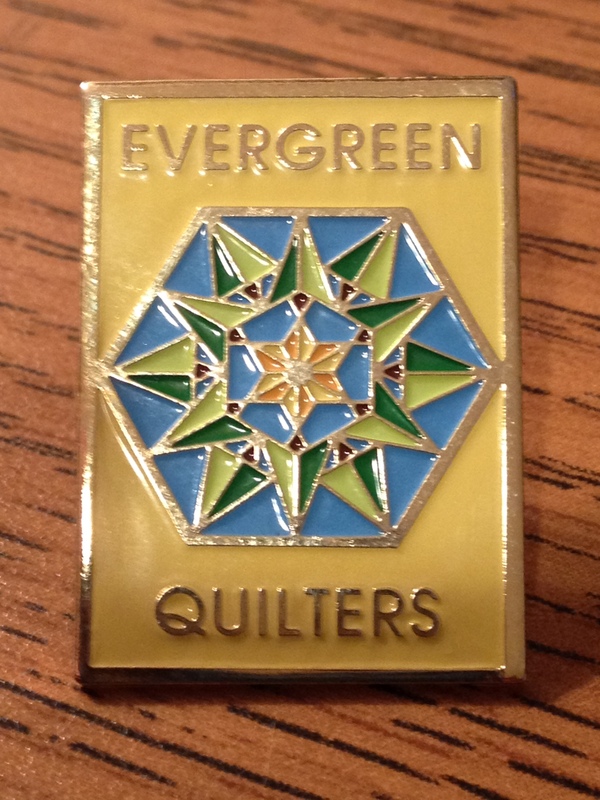 The Evergreen Quilters are a chapter of the Pine Tree State Quilt Guild. There are chapters all over the state, we are located in Southern York County. 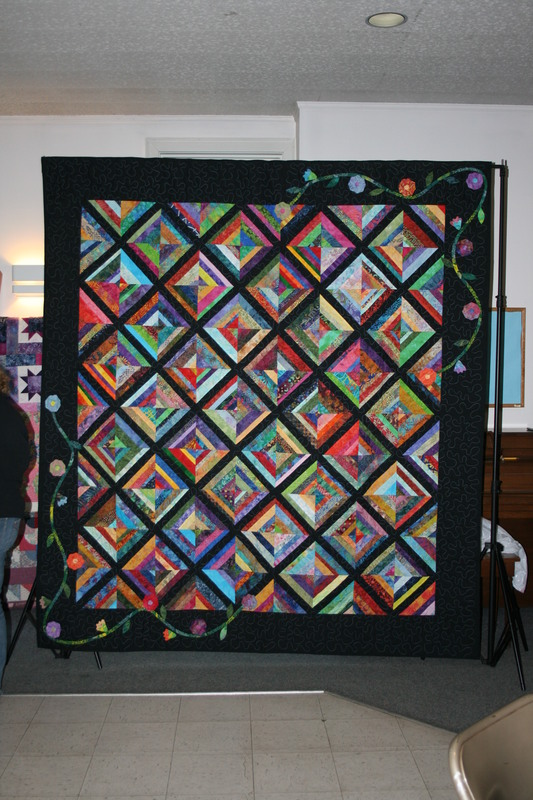 Quilt guilds are a wonderful way to meet other quilters, to learn new techniques, to join with others to make items for Charity and to just have some fun. When I moved to Maine in 2008 I knew that the best way to meet people with the same interests as I have was to find some quilters. I googled Quilt guilds in Maine and all of the information that I needed to jump into the quilting fray was right there in front of me. I contacted the President of the Evergreen Chapter and the ball started rolling. Turns out the President was a friend of my neighbor, who was also a quilter. The friendships that have developed from my membership in the quilt guild are wonderful. Haha! but that is not really the topic that I started with when my fingers hit the keys. What I was going to talk about was how wonderful quilters are!! Every year we donated approximately 300 Placemats to Meal on Wheels in York County. 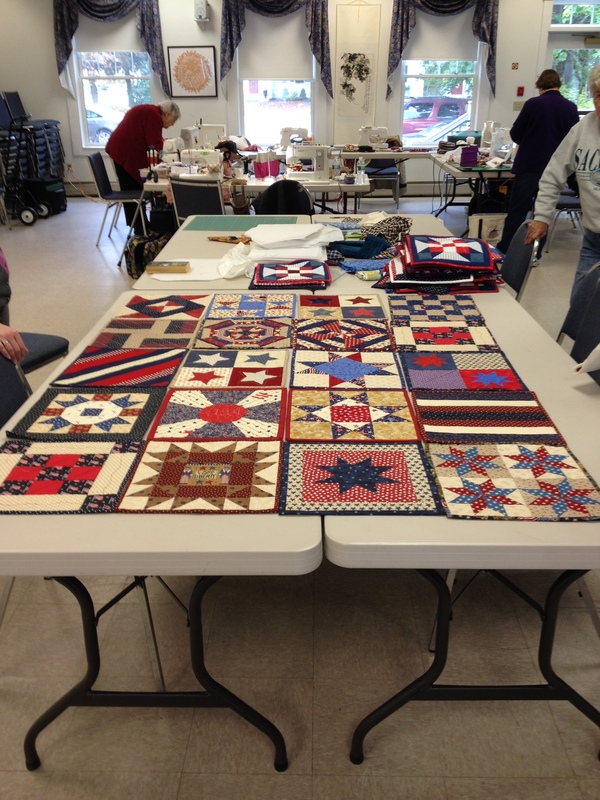 This year we have completed or in the process of completing 14 Red, White and Blue quilts to be donated to Veterans. We handed out 24 packets of fabric to make quilts for children in need. Some will be Linus quilts, some will be for Wrap-a-Smile (where over 19,000 quilts have been donated), some will go to the battered woman shelter. There are sadly always children in need of the hug of a homemade quilt. We loaded the back of a Jeep with handmade tote bags and toiletries for the battered women’s shelter to distribute to the women who leave their homes with next to nothing. We congregate, we laugh, we create, we encourage, we teach, we comfort, we support, we share, we donate, we make friends and we quilt! 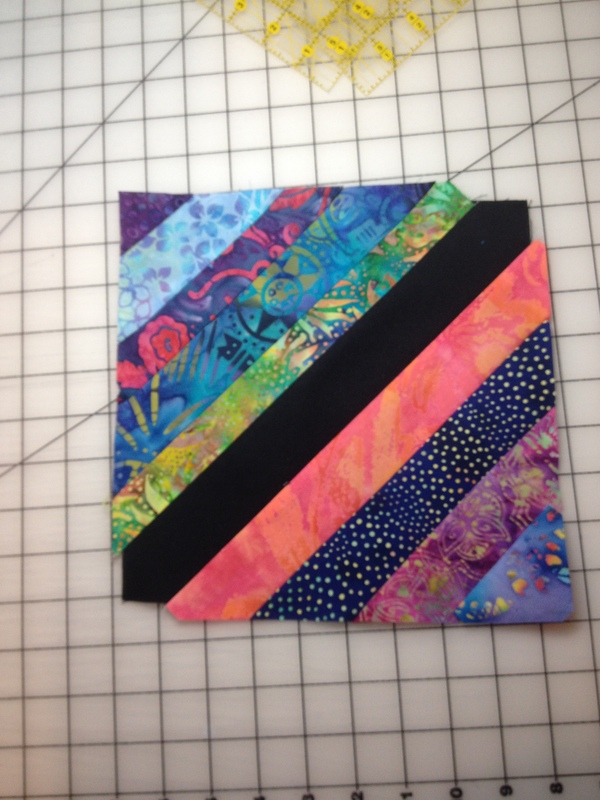 We are all working on a Raffle quilt that will raise money to support our guild – all members who would like to make a quilt block, we get together to lay it out, sew it together and another member will quilt it for us. While doing this we learn new techniques, work together, make new friends and have some fun. 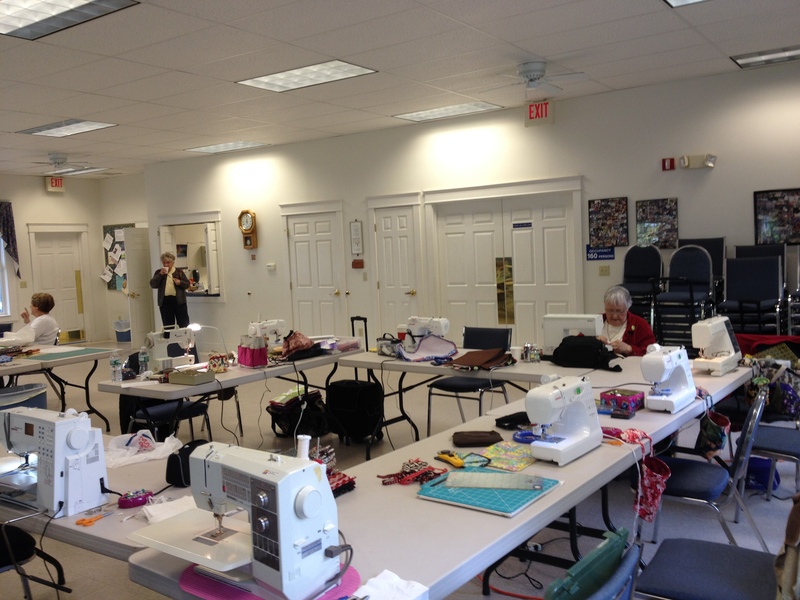 So if you are a quilter and you are quilting alone, find a group! It doesn’t have to be an organized group with dues and rules – it can be a group that you meet at your local fabric shop, it can be a group that you have met online or on Facebook. It starts out being about quilts and fabric and patterns and ends up being about friendships and support and real life. Get involved – take from it what you need and give to it what you can. It will be a blessing.